BRUCE R. HOPKINS is a senior partner with the firm Polsinelli Shughart PC. He is the author or coauthor of thirty books, including The Law of Tax-Exempt Organizations, Tenth Edition; Planning Guide for the Law of Tax-Exempt Organizations; The Tax Law of Charitable Giving, Fourth Edition; and The Law of Fundraising, Fourth Edition, as well as the monthly newsletter Bruce R. Hopkins' Nonprofit Counsel, all published by Wiley. VIRGINIA C. GROSS is a shareholder with the law firm Polsinelli Shughart PC. She concentrates her practice on counseling nonprofit organizations on their tax-exempt and nonprofit law matters. She has coauthored two other books for Wiley, Nonprofit Governance: Law, Practices, and Trends and The New Form 990: Law, Policy, and Preparation. Virginia is a frequent writer and speaker on nonprofit law topics. THOMAS J. SCHENKELBERG is chair of the Polsinelli Shughart's Nonprofit Organizations Practice Group. His clients include national hospital systems, research organizations, private foundations, colleges, universities, associations, social welfare organizations, PACs, and governmental entities. He is a frequent writer and speaker on nonprofit law topics. 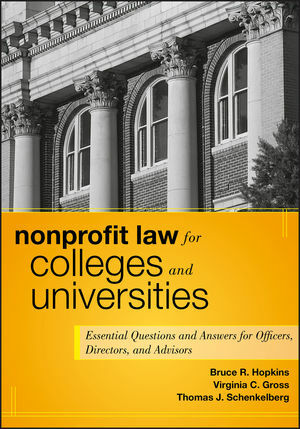 Chapter 1 Nonprofit Organizations Law Generally. Chapter 2 Nonprofit Educational Organizations. Chapter 3 Acquiring and Maintaining Tax-Exempt Status. Chapter 4 Acquiring and Maintaining Public Charity Status. Public Charity Law in General. Chapter 6 Private Inurement, Private Benefit, and Excess Benefit Transactions. Executive Compensation and the Governing Board. Trade, Business, and Professional Associations. Chapter 9 Political Campaign Activities. Basic Federal Tax Law Rules. Chapter 11 Scholarships, Fellowships, and Other Student Assistance. Chapter 12 Charitable Giving Rules. Conditional, Unrestricted, and Restricted Gifts. Other Gifts of Remainder Interests. Chapter 14 Unrelated Business Activities in General. Chapter 15 Contemporary Application of the Unrelated Business Income Rules. Partnerships and Limited Liability Companies. Tax-Exempt Organizations and Joint Ventures. Tax-Exempt Organizations, Partnerships and Limited Liability Companies. Chapter 17 Annual Information and Other Returns. Unrelated Business Income Tax Returns. Accounting Methods and Financial Statements. Public Inspection and Recordkeeping Requirements. Chapter 18 Disclosure and Distribution Rules.